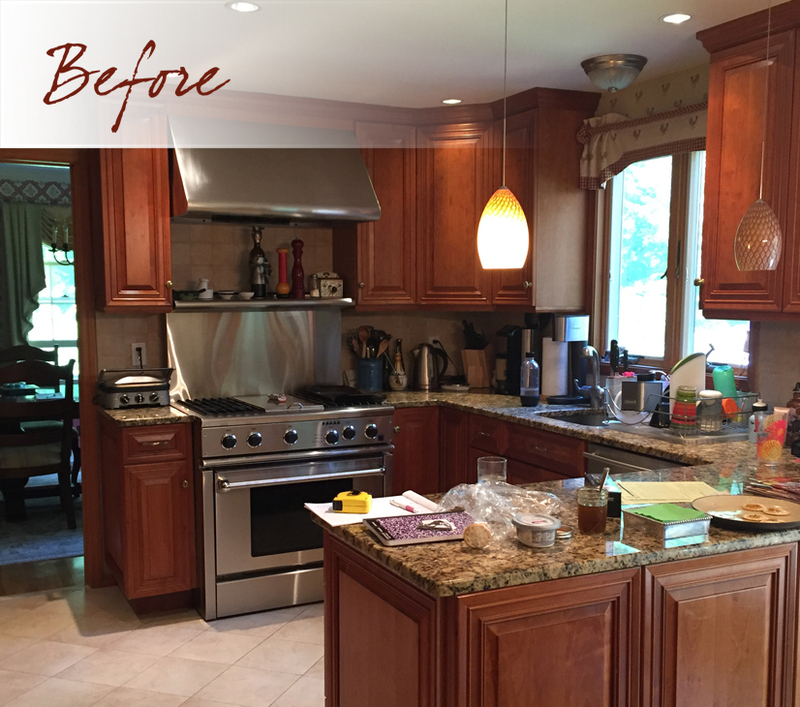 “A dark, cramped kitchen was transformed into a light, open space for multiple cooks. 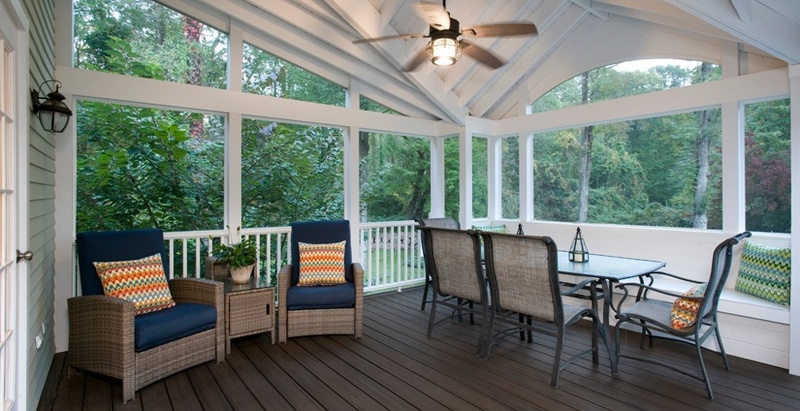 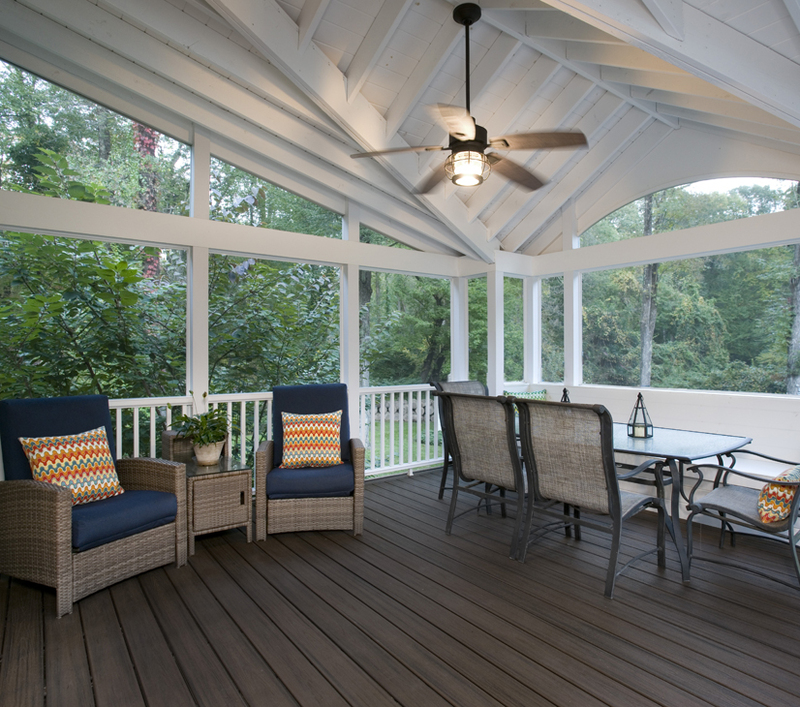 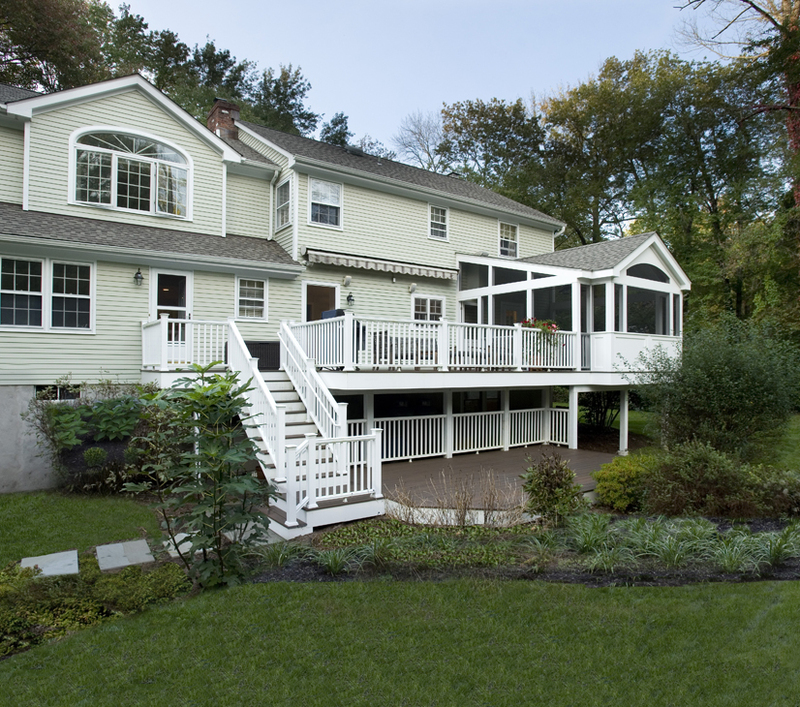 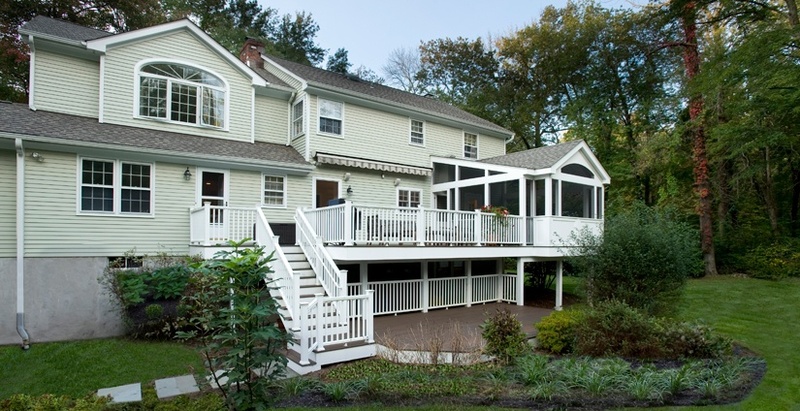 An adjacent screened porch addition provides a gracious outdoor space for entertaining or just reading a book." 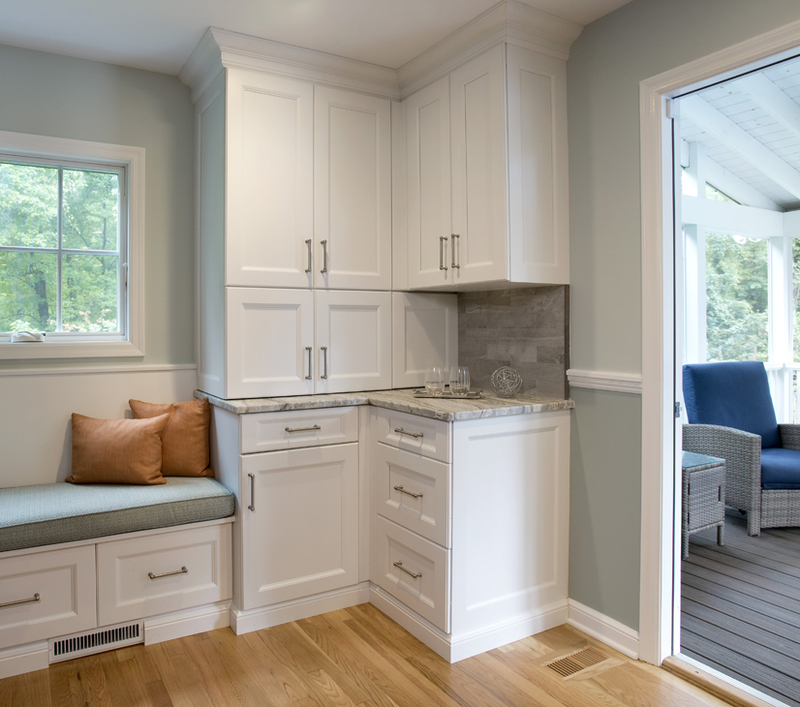 To enlarge the kitchen to fit multiple cooks and helpers, with a flow that would integrate seamlessly with outdoor spaces including a new screened porch and deck. 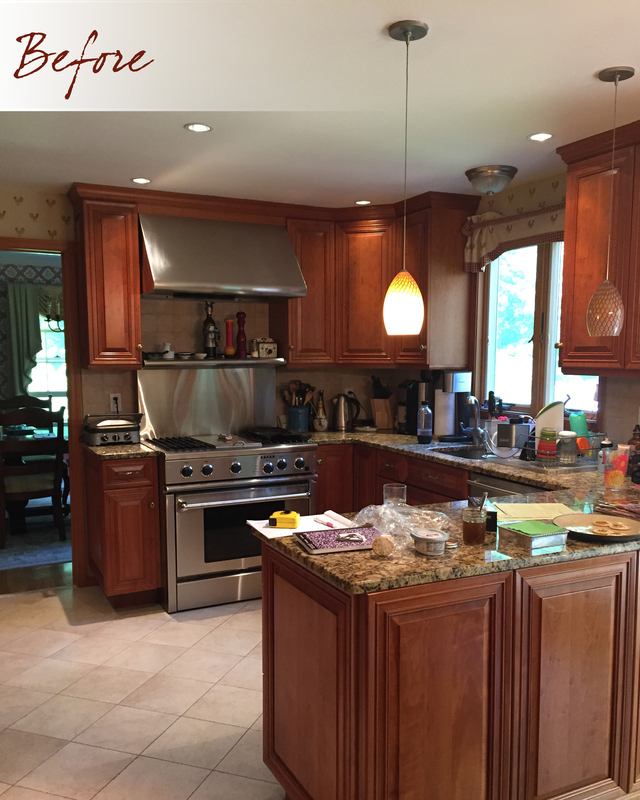 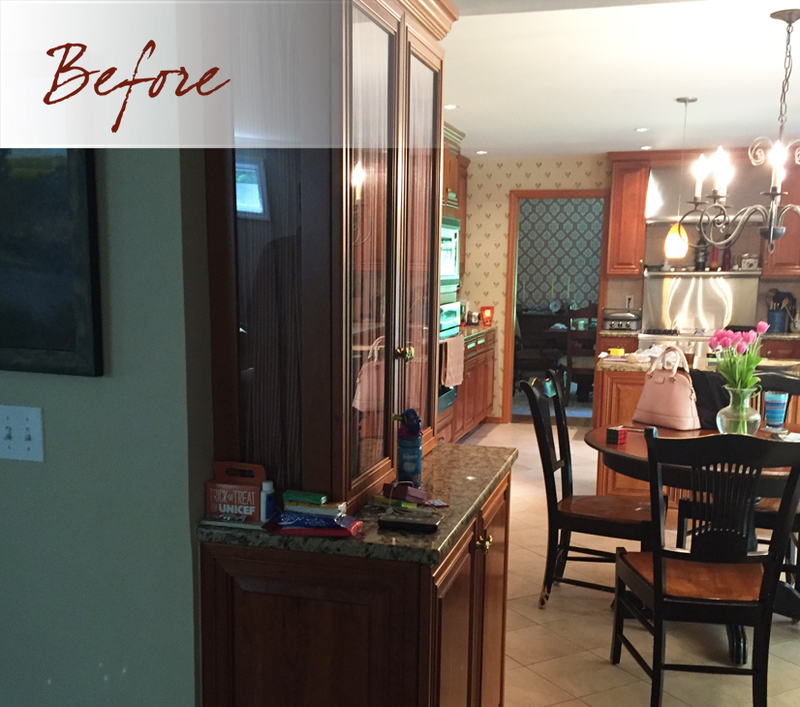 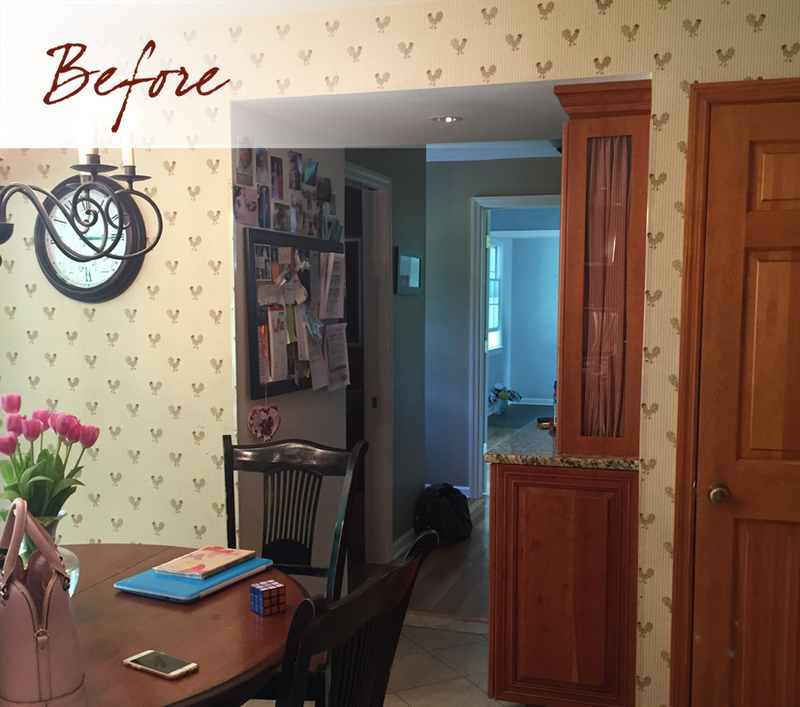 Formerly darked and cramped, the new kitchen expanded into the dining room. 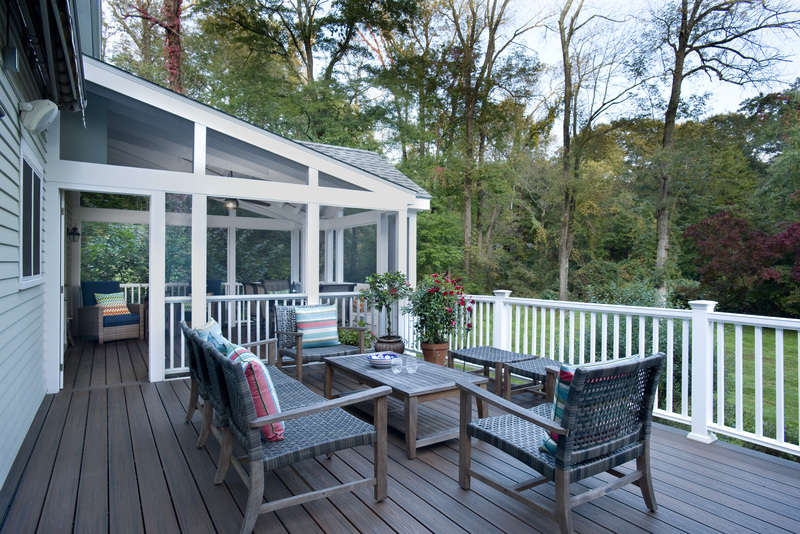 The use of rustic materials and clean lines make this kitchen remodel and screened porch addition a standout. 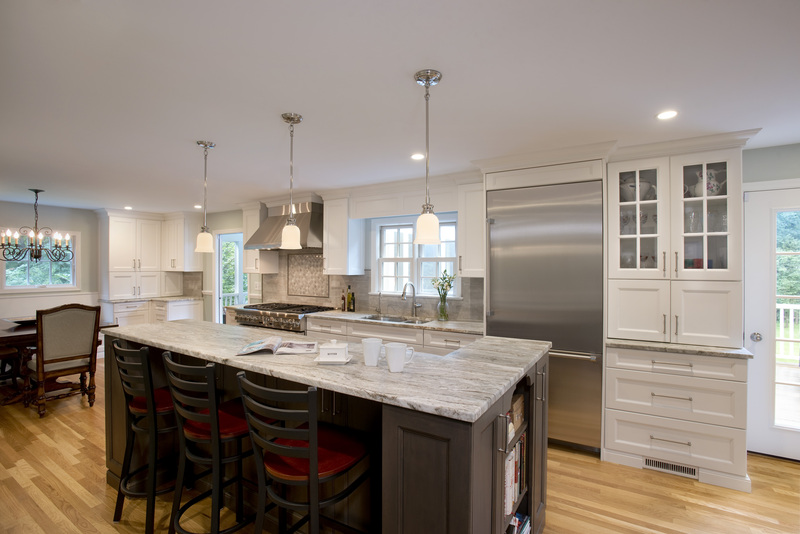 A natural stone bi-level island, with a leathered texture and bold colored veining provides a large work surface, as well as seating to hang out and watch what's going on. 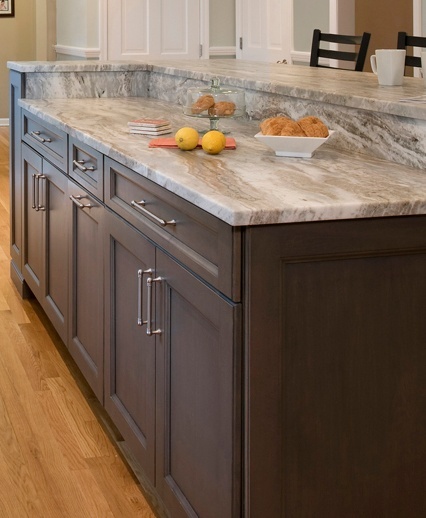 The Grabill island cabinets are a custom dark grey stain, complimenting the counter colors. 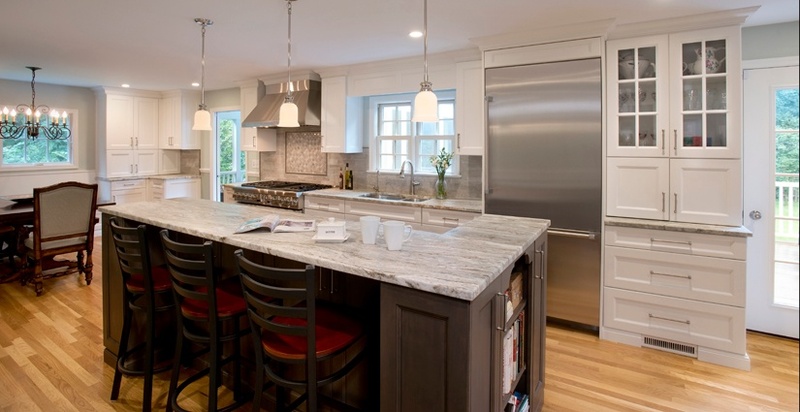 The island has lots of storage, including a cookbook bookshelf at one end, and pull out trash in the center and extra storage on the end under the taller counter. 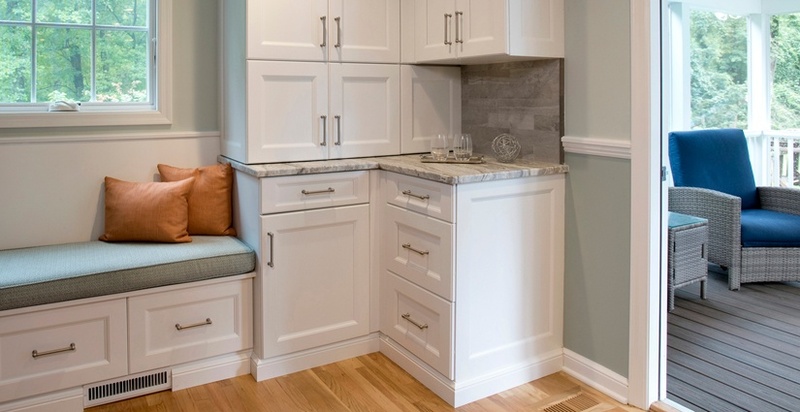 A corner unit and banquette occupy the end wall of the former dining room. 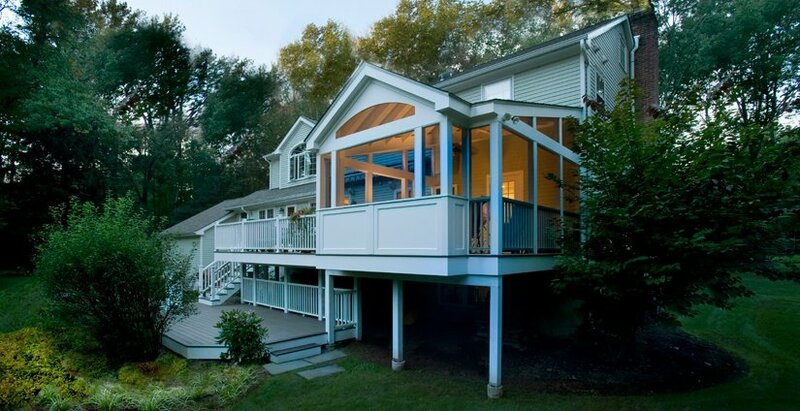 You can see a glimpse of the new screened porch off the new kitchen. 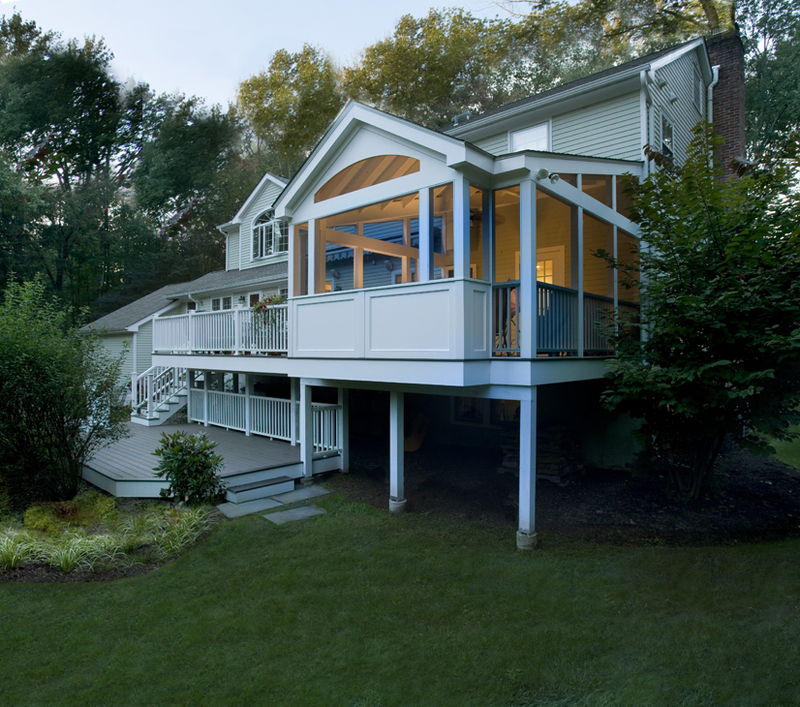 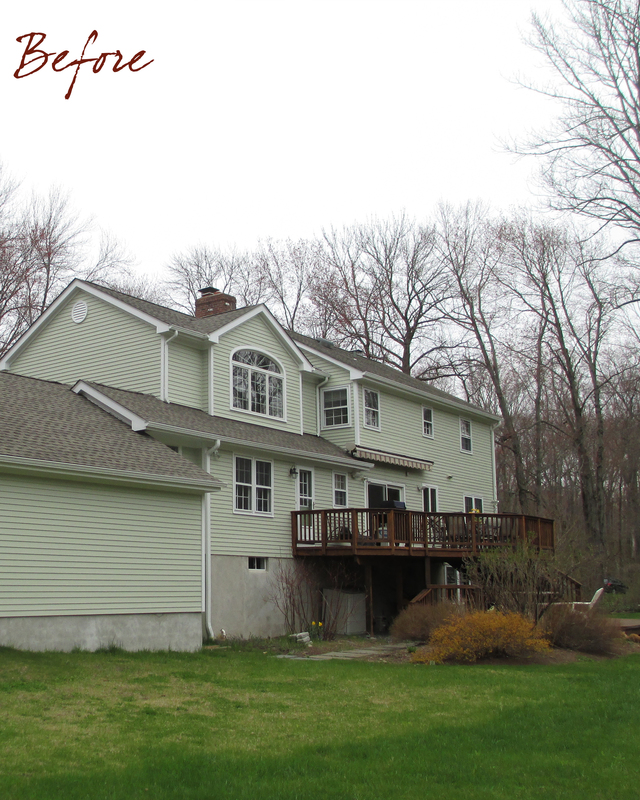 The screened porch’s size, shape and detailing complement the rear elevation of the existing house. 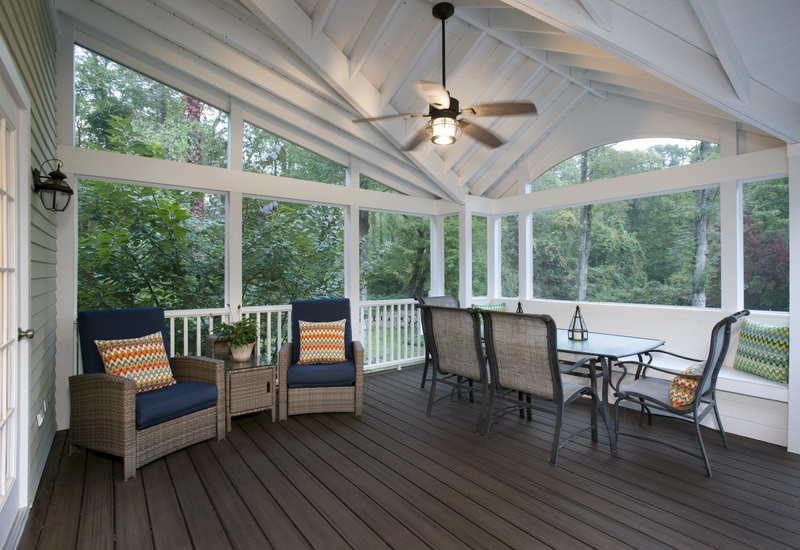 The vaulted ceiling of the screened porch adds interest and gives a coffered ceiling effect. 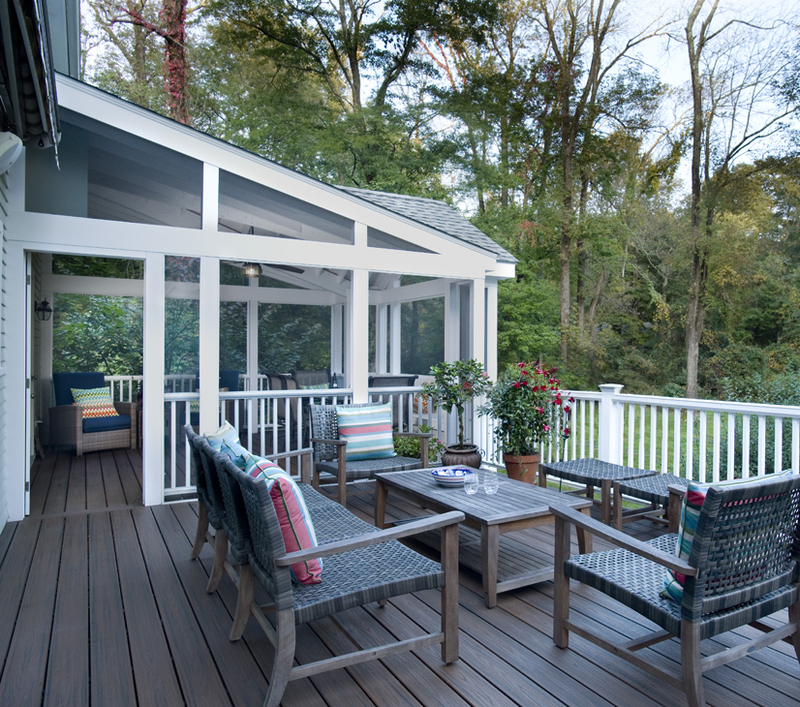 A sweet sitting area and dining table sits easily underneath the detailing of the porch’s upper architecture. 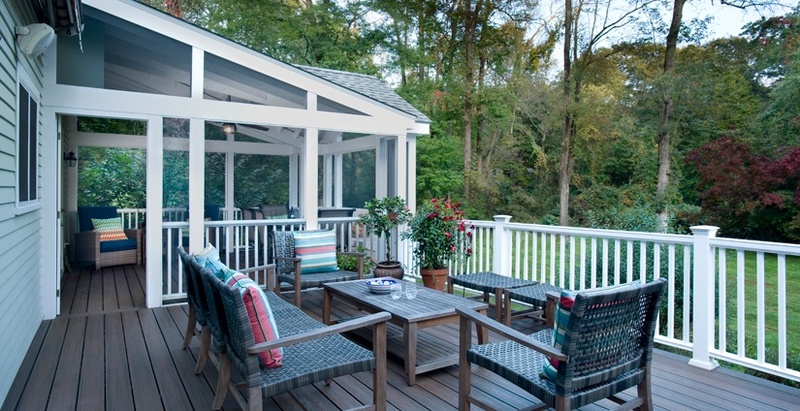 Small touches, like vibrant pillows , add visual interest to the smooth blend of colors and textures in this sophisticated but comfortable porch escape. 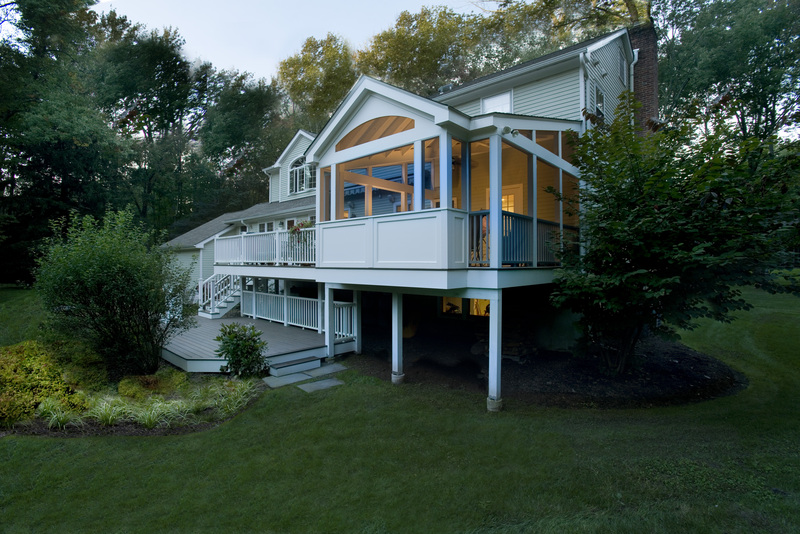 Just plush enough, the pillows and cushions create some contrast to the hardness of the wood structure with its clean lines and columns. 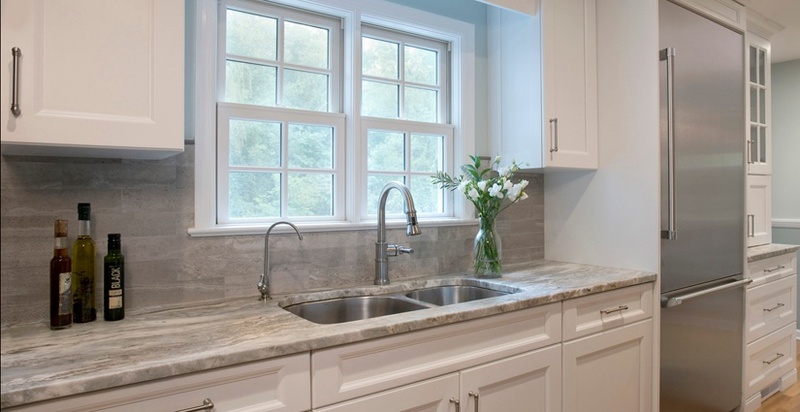 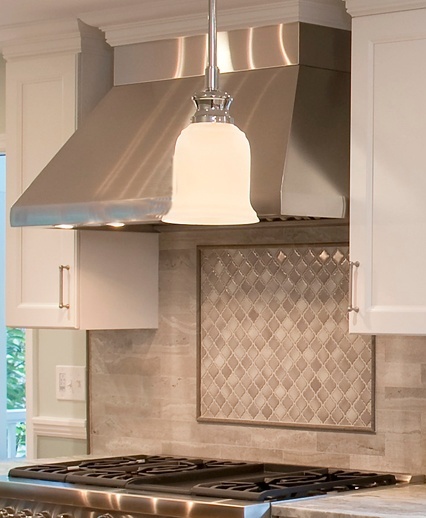 Arabesque glossy tile adds interest and texture to the tile detail at the hood. 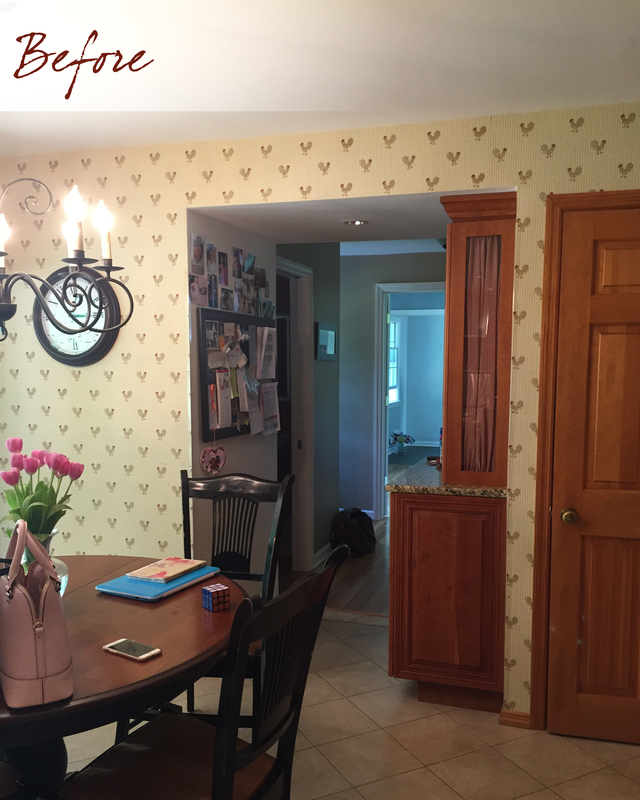 A darked honed pencil edge borders the field tile. 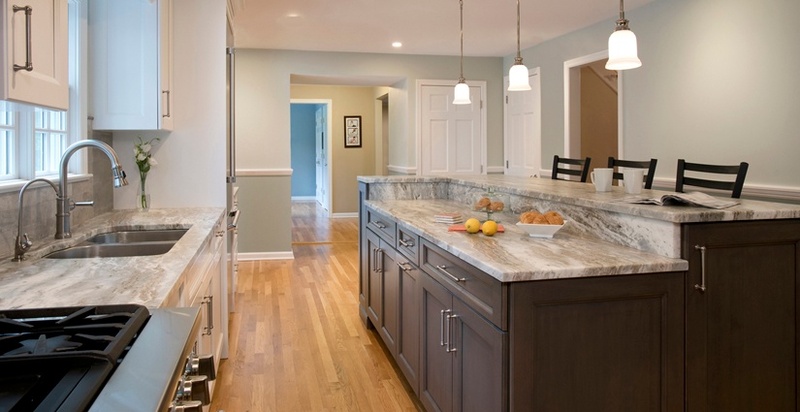 The Fantasy Brown island has beautiful colors and veining. 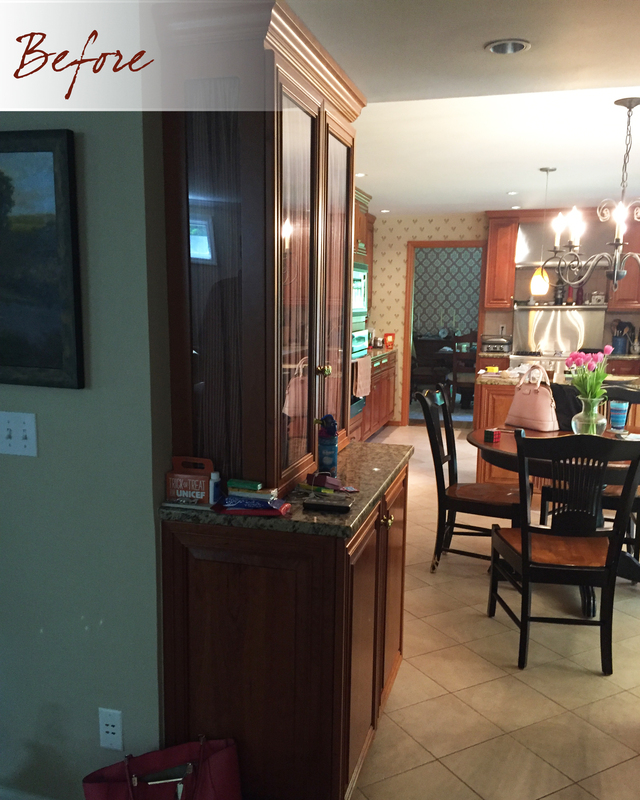 It's bold and interesting without being too busy, and has a leathered finish. 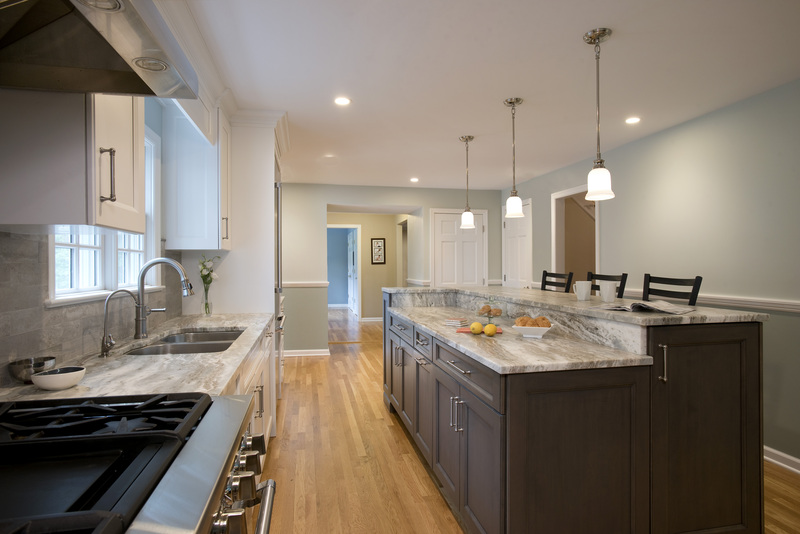 "We have done three projects with Clark Construction in the last five years and continue to be thrilled with the results. 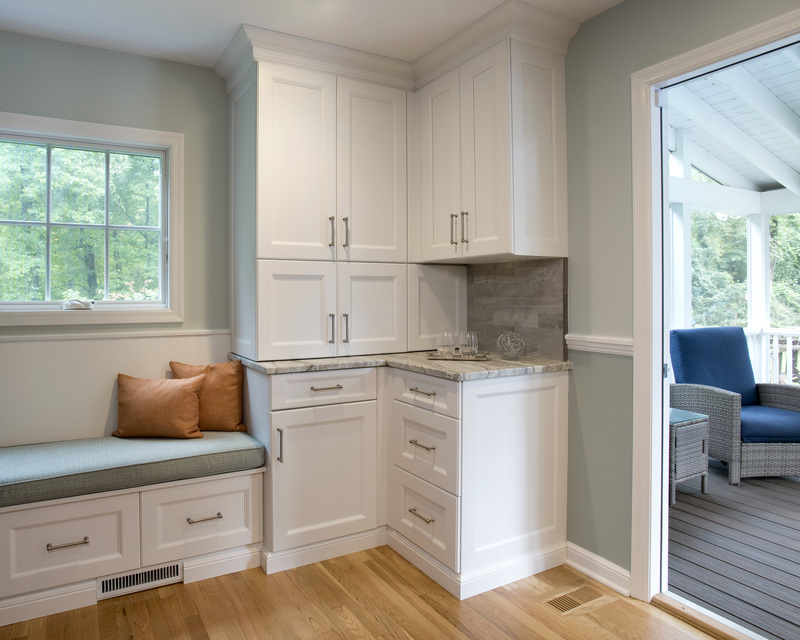 The common thread through all of the projects has been the detail of project planning and design, the quality of the work, and the ability to stay right on schedule. 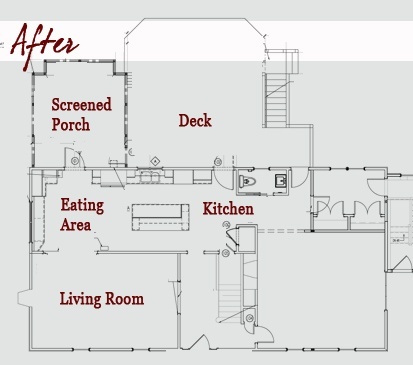 In the end, the proof is in the results. 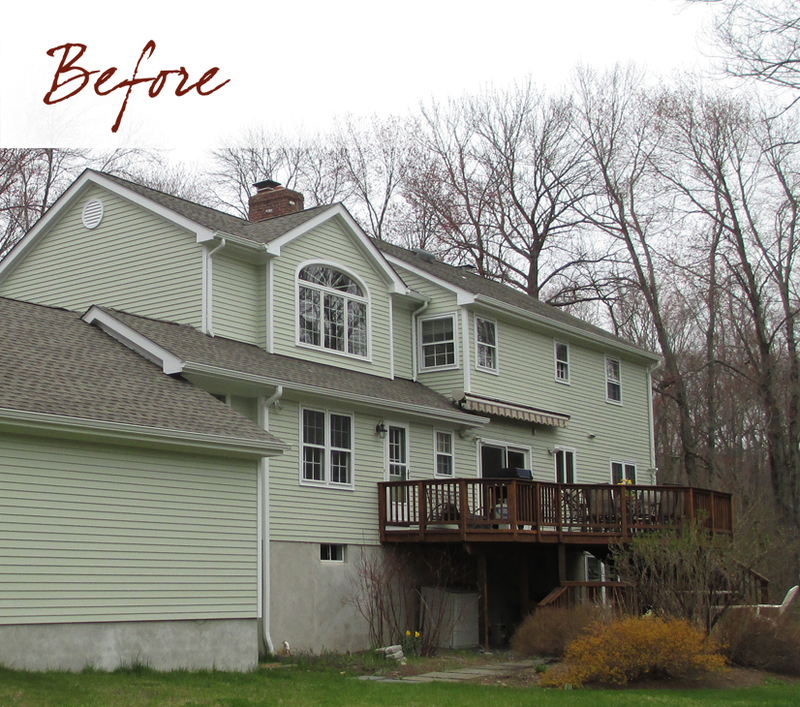 We love the work that has been done in each of our projects. 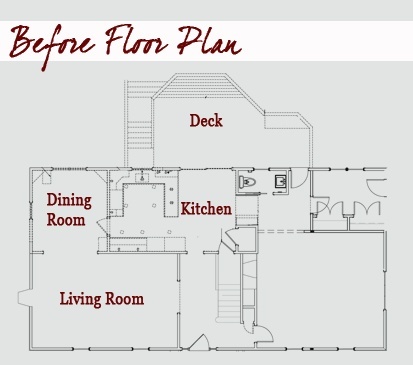 We ended up with great designs, usable and functional space, and very high quality craftsmanship. 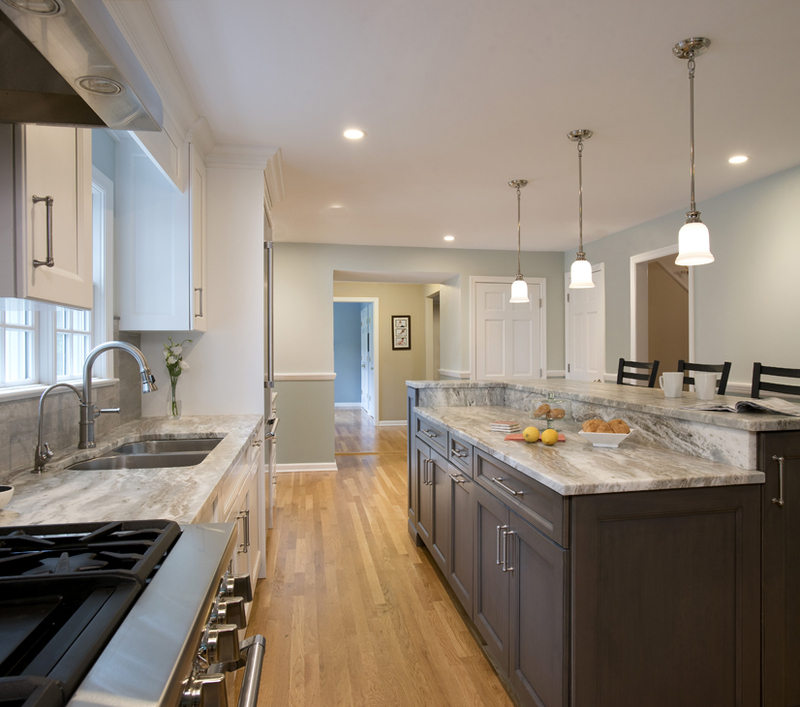 We did not have surprise costs along the way and all of our projects finished either early or on time relative to the agreed upon timeline ." 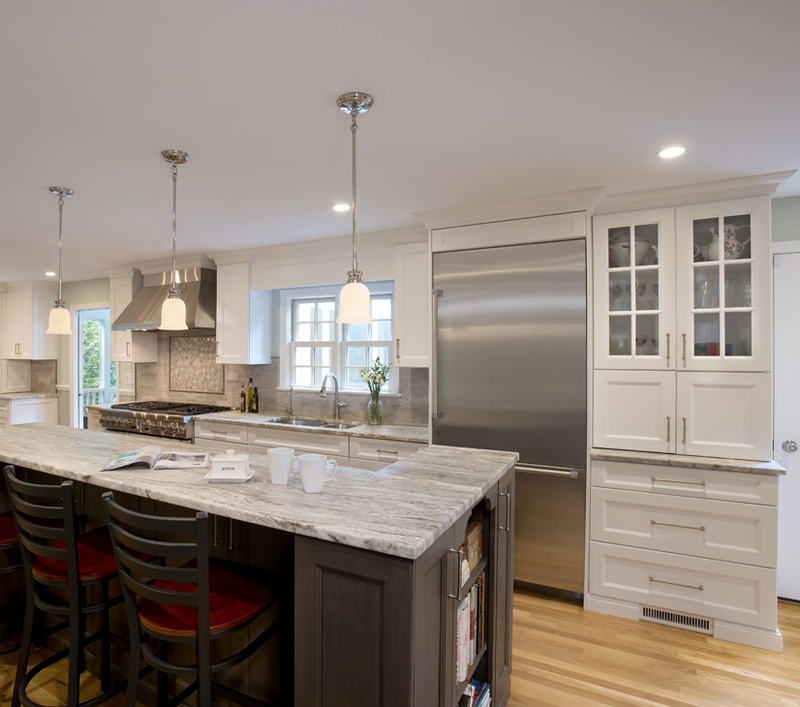 We'd love to do a project with you.